Rediff.com » Movies » Johnny Depp on Broadway? When success comes to a low-budget film production, in the form of Golden Globe nominations, a bushelful of various awards, and tons of Oscar buzz, not to mention well enough box-office clout to ensure a sizeable chunk of profit, the question asked is simple: How to not make it ever stop? Finding Neverland, armed with the honours for Best Picture of the Year at the National Board of Review awards, is facing such a dilemma. Johnny Depp's dishy mug could soon be gracing dishes and mugs, but the film about the Peter Pan creator is a poignant tale, and really not one given to McDonald's Happy Meal merchandise. So producer Nellie Bellflower wants to carry the legacy of the film forward by making Finding Neverland - The Musical. 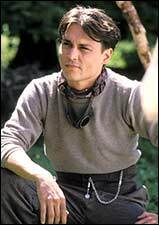 Finding Neverland, about the life of J M Barrie, is a biopic garnering much critical acclaim, and stars Johnny Depp, Kate Winslet and Dustin Hoffman. It is too early to speculate if any of the stars will hop aboard the Broadway version, but it is not unlikely that Depp might essay the role for a limited first run.